Workers at the Douglas Aircraft factory in Long Beach, California check out a completed B-17F Flying Fortress. Note that the censor has blacked out not only the tail number but also the number on the nose of the aircraft. One of 605 built by Douglas in a $12 million facility built for military aircraft production. Boeing coordinated B-17F production with Douglas and Lockheed's Vega subsidiary through the BDV committee, which provided example aircraft and blueprints and tracked all of the various aircraft modifications so the B-17 could be properly serviced in the field. Boeing, Vega and Douglas made 3405 B-17Fs, the second most produced model. While externally the same as the previous B-17E, it had a one-piece plexiglass nose and upgraded Wright R-1820-97 Cyclone engines, which made the B-17F the fastest fortress model. Almost all B-17s were sent to Europe for the 8th Air Force. At modification centers stateside and in England, fortresses were modified, adding additional armor and machine guns. As the German Luftwaffe began to favor frontal attacks to kill the pilots and bombardier, the original .30 caliber (7.62 mm) machine gun in the nose was replaced with a .50 caliber (12.7 mm), and other machine guns were added or moved to fire forward. Eventually these modifications were added to the assembly line. This early model B-17F lacks the additional machine guns that would be later added before combat. 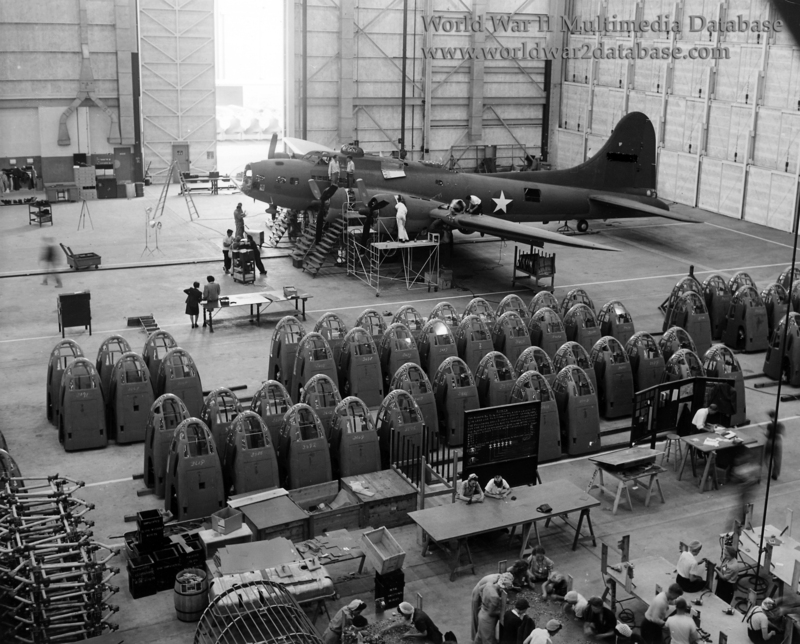 Noses of Douglas A-20 Havocs are found lined up on the floor waiting for assembly.